From the edge of the Sahara desert, to the highlands of Ethiopia; from the lowlands of Kenya’s Rift valley to Rwanda’s thousand hills; and from the vast plains of Tanzania to the fertile volcanic soils of Uganda, farmers are bucking a convention that started with the agricultural revolution more than 10,000 years ago in the fertile crescent, stretching from Egypt through Mesopotamia, and emerging in the same era in India and southern China. George March, Man and Nature, 1861. First there is disbelief that this low cost, simple technique can be beneficial. Deep-seated paradigms such as “trees are bad for crops, trees grow too slowly and indigenous trees have no value” are challenged and so there is some push-back. An enlightened few decide to pilot FMNR on a small scale. Within a short period, positive changes are self-evident; the landscape looks greener and now, with trees, is more pleasing to the eye. By thinning and pruning thorn tree thickets, light is allowed through to stimulate grass growth, and the trees themselves produce fodder. Improved habitat for natural predators results in fewer insect pests. Soil fertility increases. With lower temperatures and higher soil moisture holding capacity, when drought does occur, it has less impact. As a result of these benefits, farmers are reporting more productive farmland, higher incomes, school fees are paid on time and without stress. Children are spending more time in school and, along with their mothers, are spending less time foraging for firewood. Hope for a bright future is being restored. Confidence is growing and farmers are investing more in agriculture, because it pays to do so and because the impact of drought and flood are reduced, there are less risks – allowing for new bee hives, improved seed, fruit trees, hay making and storage facilities. Incomes increase in line with these investments. When farmers see their neighbours prospering and no longer toiling for little return, they in turn begin to take up FMNR, and what was an oddity very quickly becomes the norm and what was initially met with resistance, quickly becomes a self-propelling movement. Musa Chelelgo’s story is not atypical. Musa, from Kiambogoko district in Nakuru county in Kenya, was a struggling farmer. Musa’s farm yielded meagre harvests even in good years, and in 2009 he lost five head of cattle due to drought, despite desperately walking them long distances in search of fodder. In order to feed his family and pay school fees, Musa would leave home in search of day labour elsewhere. When he did find work, he was lucky to earn just 200 KES (Kenyan Shillings) or about US$2^ per day, barely enough to be worthwhile, but he had to do it to pay school fees. Musa’s wife, along with the other village women would regularly walk 10 kilometres to the Ebulu forest reserve to collect fuel wood and accelerate deforestation. This was exhausting work that prevented her from performing other more productive activities and it had to be repeated time and time again. Musa did not see his farm as being able to help him in his situation, let alone become a profitable enterprise. FMNR has resulted in plenty of fodder for Musa Chilelgo’s cattle, and milk production has increased from 7 litres per day, to 12 litres per day. The FMNR for Kenya Project is a partnership between World Vision Australia and the Department of Foreign Affairs and Trade (DFAT). Thanks to the project, Musa learnt about FMNR in 2013 and volunteered to become an extension agent. “FMNR has brought me far,” Musa said. “I have seen many changes here in my life. Before, I had many problems, especially for obtaining firewood and fodder and for paying school fees. 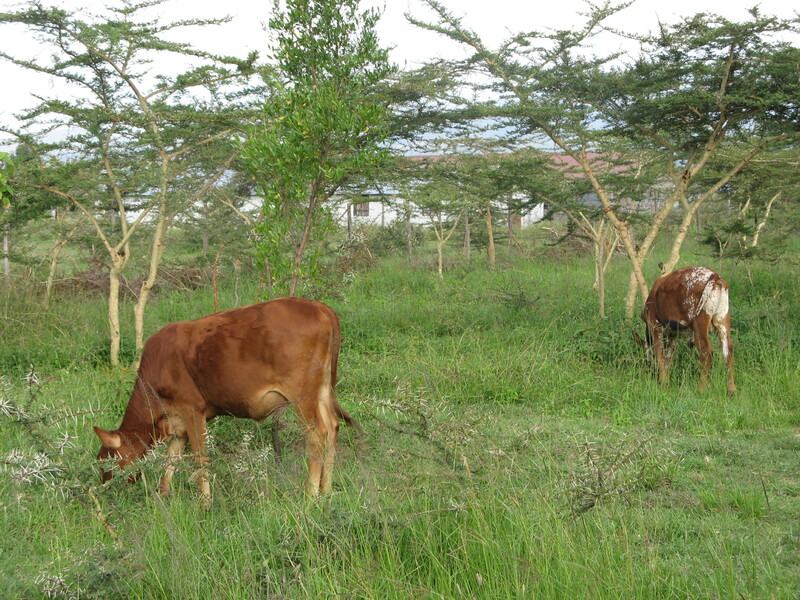 Today Musa has 2.4 hectares, 1.4 hectares of which are under dense tree cover for grazing animals and his planted crops across 1 hectare are under lower density tree cover. Musa reports that temperatures are lower, the air is fresher, and he has plenty of fodder, including from the nutritious bark of the pruned branches of indigenous acacias. Today he does not fear drought, as he has plenty of grass, tree leaves and bark, even in the dry season. Not only did he not lose any livestock during the 2014 drought, he did not have to move his animals long distances in search of fodder. In fact, he has so much fodder today that he is thinking of building a hay shed. Milk production from four cows has increased from 7 litres per day to 12 litres per day. One litre of milk sells for 40 KES (US$0.38). 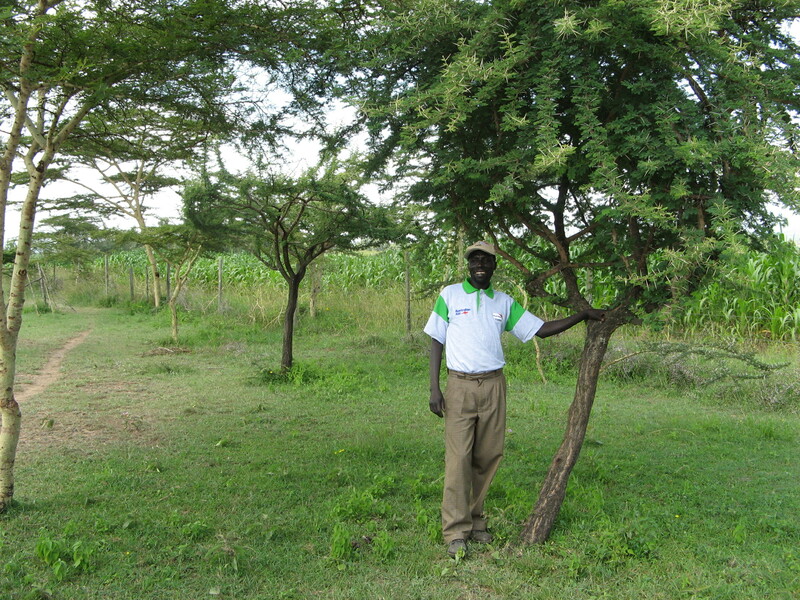 Growing trees has also enabled Musa to increase honey production. He had bee hives previously, but they only yielded 8 kgs annually per hive. Post-FMNR the same hives are yielding 32 kg annually per hive. Honey sells for 200 KES/kg (US$1.89/kg) and Musa has three hives, bringing total income from honey to 19200 KES (US$181.27). Musa plans to increase the number of hives, but at the moment, most of his earnings are going into school fees. A system of “table banking” has been instated by his farmers group. Group members pool their funds and group members apply for loans with very low interest rates. Grain yields have increased. From less than 0.4 hectares, Musa would typically harvest just 20 kgs maize, but since beginning FMNR, average yields have increased to 180 Kilograms and 90 Kilograms of dried beans. Musa says life is much better for his children. “I am no longer obliged to search for day labour far from home. I now stay home because FMNR has employed me,” he said. Money earned from FMNR has enabled Musa to fence and subdivide his farm with barbed wire. Musa is planting Rhodes grass also and plans to bale and sell hay in the future. One bale can sell for 400 KES (US$3.78) when there is high demand. 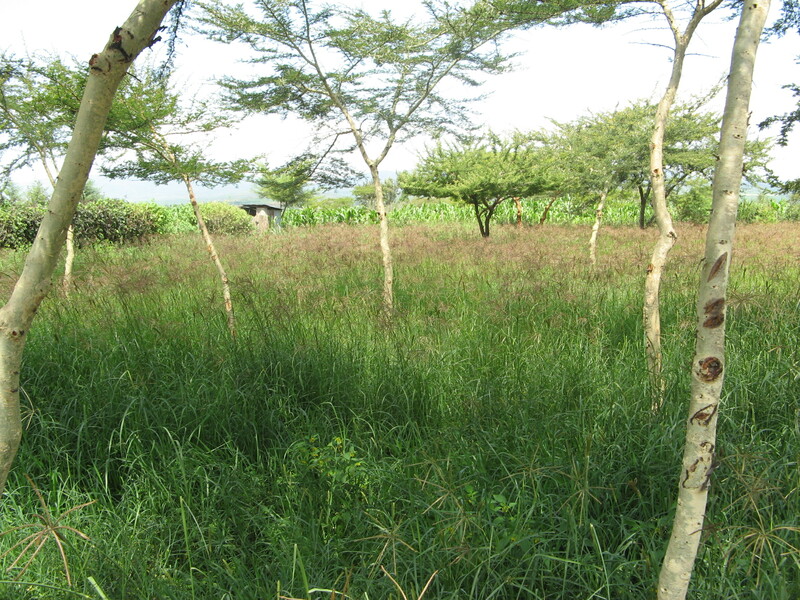 It is very noticeable that Rhodes grass is much greener and denser beneath the pruned acacia trees than out in the open. Musa says that “FMNR has opened my horizons to be a farmer and to adopt innovation. Before, the farm wasn’t much more than a place to live and it had low productivity and in fact was a liability as I regularly lost my cows during drought. I did not see farming as a viable way to meet my family’s needs. Today I have a growing and thriving business which supports my family. Because of Musa’s renewed confidence and the reduction of risk in his farming enterprise, Musa is investing in improving his farms’ productivity even further. So sweeping and significant have the changes arising from FMNR been that Musa and his neigbours have come up with a new catch-cry “Melele FMNR, FMNR melele” (Forever FMNR, FMNR forever). *Source: Global Forest Resources Assessment 2015, Food and Agriculture Organization of the United Nations. ^Currency conversions based on exchange rates as at 16 September, 2015.